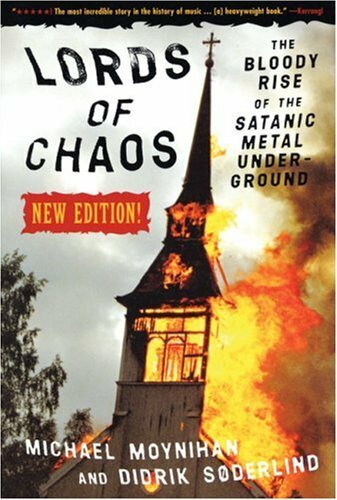 “An unusual combination of true crime journalism, rock and roll reporting and underground obsessiveness, Lord of Chaos turns into one of the more fascinating reads in a long time. This unpredictable collection of interviews, histories, quotes and anecdotes stares long and hard into the dark heart of the Satanic Black Metal movement and returns with a sober analysis on the subject. — Bob Larson, radio & TV personality, author of numerous Christian-oriented books on Satanism, the Occult, and contemporary culture. “Rev up a chainsaw. Flick on the blender and a couple of power drills. Stand directly behind an F-16, right before it blasts off into space. A jackhammer should do to set the tempo. Now get down on all fours, contort your face into the wickedest grimace you can muster, and scream until your vocal chords collapse. If all of this makes you feel just the least bit ridiculous, hit yourself in the face with a roofing hammer until you can’t laugh anymore. There now. Listen carefully. This is what Black Metal sounds like.